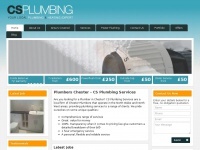 CS Plumbing Services for Plumbers Chester and Emergency Plumbers in Chester. Covering Chester, Mold, Wrexham, Wirral & Ellesmere Port. Csplumbingservices.co.uk presents an article about a specific topic. The website Csplumbingservices.co.uk has a own web server. The web server only runs this website. The websites of Csplumbingservices.co.uk are served by a Apache server. The content management system WordPress in the version 3.5.1 is used. The markup language of the website is XHTML 1.0 Transitional. The visitor analysis software Google Analytics is used to analyze the visitors of the websites. The website does not specify details about the inclusion of its content in search engines. For this reason the content will be included by search engines.